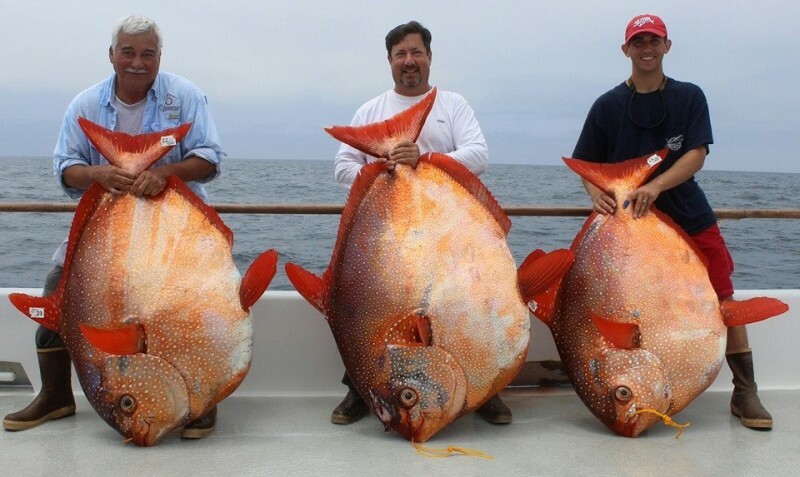 Earlier this month OutdoorHub reported on a trio of anglers who all managed to harvest a rare opah during their fishing trip near San Martin. As if that feat was not impressive enough, one of the anglers is now applying to the International Game Fish Association for a shot at the world record. The three anglers were in Mexican waters aboard Fleck’s Excel, a long range sport-fishing ship operating out of San Diego. The fishermen were initially chasing yellowtail but soon ran into a “school” of five opahs. This is especially unusual since the species is not known to band together, and is considered very rare in West Coast waters. Opah have been drawing more interest among recreational anglers in recent years but are still not usually targeted by saltwater fishermen. Although expects expect the deepwater fish is plentiful, few commercial fishermen actively fish for opah, instead only finding them occasionally as bycatch. Joe Ludlow was the first of the three anglers to land his opah, after a 30-minute fight with the 181-pound fish. According to Excel Sportfishing, Armando Castillo and Travis Savala quickly followed suit with a 151-pound and 124 pound opah. “I have been on the Excel a long time and I had only seen one Opah!” Fleck later wrote. All three were behemoth specimens, but Ludlow’s catch may very well displace the world record held by the IFGA. That honor currently belongs to a 163-pound opah caught by Thomas foran near California’s Port San Luis Obispo in 1998. Fleck says that all the required paperwork has already been submitted to the IGFA for consideration, which usually take a few weeks.